~ Fun-spirited challenges, practical simulations and team-building activities in an interactive learning environment to foster co-operation and understanding while providing hands-on experiences that highlight barriers to access. ~ Team-building exercises designed to increase staff morale, respect, and loyalty, while training participants to be adaptive and accommodating. ~ Sessions go ‘Beyond the Building Code’ to explain the rationale behind the regulation through interactive and anecdotal discussions such as; ‘Wash the Wheels’, ‘Sanitation Station’ and ‘Spin Me Round’. ~ Sessions employ experiential teaching methods, empathetic models and simulation activities to train staff in accessibility and barriers to access. Quite simply, we put people in wheelchairs (and other first-hand exercises providing “in their shoes” experiences for a better understanding of barriers facing persons with disabilities). Roll a Mile Accessibility Training – provides front-line staff with the awareness to provide adaptive, accommodating service improving corporate perception, customer satisfaction & consumer loyalty. Participants: develop an increased understanding of barriers and accessibility policies, procedures, physical structure & compliance items; compare legislated accessibility to actual accessibility; learn tips & practical strategies for adapting services to effectively accommodate persons with a variety of disabilities; review policies, practices and procedures relating to the provision of goods or services to people with disabilities. Roll a Mile Advanced Accessibility Training – perfect for business owners, managers and human resource professionals seeking to gain an advanced awareness of accessibility, compliance requirements, barriers to access and cost-effective implementation solutions for accommodation and barrier removal. Participants: develop an increased understanding of barriers and accessibility policies, procedures, physical structure & compliance items; compare legislated accessibility to actual accessibility; review policies, practices and procedures relating to the provision of goods or services to people with disabilities. 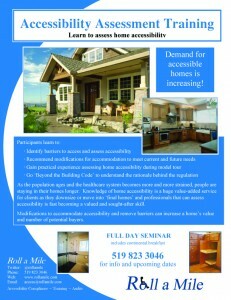 Roll a Mile Home Accessibility Training – Perfect for realtors, brokers, contractors, designers, architects, builders, home Inspectors, planners, insurance, and senior service professionals. As the population ages and the healthcare system becomes more and more strained, people are staying in their homes longer. Knowledge of home accessibility is a huge value-added service for clients as they downsize or move into ‘final homes’ and professionals that can assess accessibility is fast becoming a valued and sought-after skill. Modifications to accommodate accessibility and remove barriers can increase a home’s value and number of potential buyers. 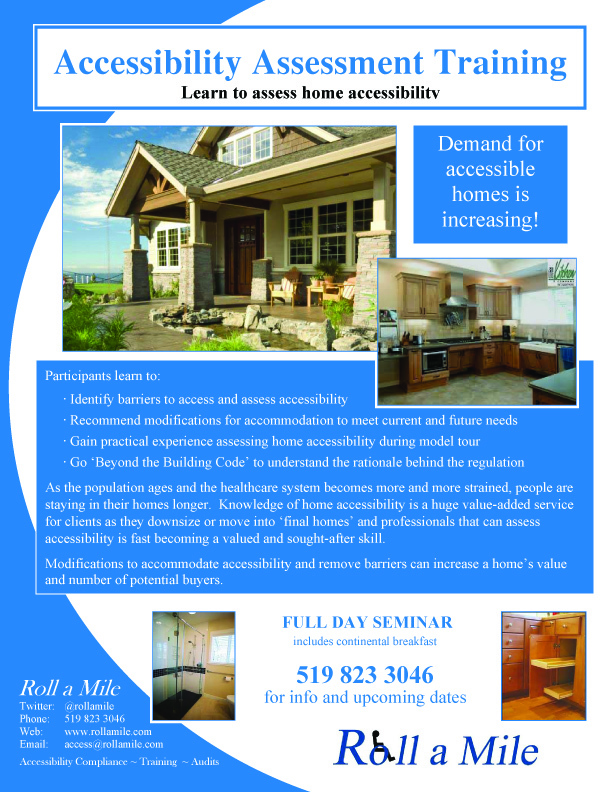 Participants learn to: identify barriers to access and assess accessibility, recommend modifications for accommodation to meet current and future needs; gain practical experience assessing home accessibility during model tour; and ‘ Go ‘Beyond the Building Code’ to understand the rationale behind the regulation.